Brilliant ideas. How easy life would be if they were true. Now with some wisdom, we still ask ourselves what the future will be like. And for those of us in A&D, “What will the future workplace look like?” is an all-too-common question. Maybe I’m still trapped at six, but my answer has only two words: The Jetson’s. An animated sitcom originally airing in the 60s and again in the 80s, The Jetsons was the image of the future. Robotic contraptions, holograms, whimsical inventions, and supersonic tubes depicted the year 2062. It’s with visions planted by this program that I now imagine a future workplace as an amusement park for adults. 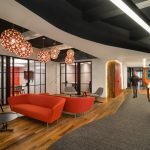 The typical cubical will be for the history books, replaced with coffee shops that can transform into personal offices or meeting rooms simply by pressing a button on a iPhone or iPad. Instantly the quaint round coffee tables and lounge chairs will transform into executive desks and task chairs. Coffee bars will flip over to reveal copy machines, computers, and various paper supplies. Making copies, running errands and grabbing coffee from Starbucks or Dunkin’ Donuts will be done by robots called interns. Telephone conversations and meetings in-person won’t be necessary. Since teleconferencing and email have become so popular, the future will bring advanced videoconferencing and interactive boardrooms. Holograms will include all of our colleagues. Automatic doors that open from floor-to-ceiling will be the entrance to every space possible, if there are physical office buildings, that is. The way trends are happening now with working from home, ruling out the extinction of headquarters isn’t impossible. The saying goes, history repeats itself, and when the first computer was invented, it was the size of an entire room and now it can fit in the palm of your hand. Much like the reduction in the size of the computer, the concept of a company’s headquarters is bound to be minimized as well. Rather than the advancements in technology being directed to suit companies as a whole, I imagine they will be focused to suit each individual at their own respective homes. Although the future of the workplace is exciting to imagine, not every aspect of the future is foreseen as positive. While email, videoconferencing and working from home may be convenient and less expensive, there is an aspect of the social workplace that is becoming extinct. This aspect is one we long for since we were children. Personal interaction, much like making friends on the playground when you were younger, parallels discovering potential employees in face-to-face interviews rather than solely on paper. This individual’s potential is displayed through walking the job site, collaborating with colleagues and solving problems. The interview is crucial. How you present yourself as in individual, your background, upbringing, the weakness you’ve overcome and the strengths you’ve developed aren’t portrayed in an 8.5” x 11” space. Much like on your resume, the social skills, ethics and values parents have instilled in their children are almost invisible in an email today. Anyone can be trained to use correct grammar, punctuation, and flattery. While we dream up the workplace of the future, why don’t we dream up how to keep personal experience for the employee as well? Dream up how to form new, and strengthen existing networks and how to form loyal relationships with clients. Imagine how the futuristic workplace will be with both the latest and greatest technology and the best people out there. Technology advances each and every day. Personal interactions are dwindling by the minute. The future workplace we all dream of should not exist of holograms or hovercrafts, but rather the perfect balance between real technology and real relationships. If possible, you should make sure to add/include the credits for the photo images and desing of the office project in Japan.